Well I may have finished knitting for my baby (although I do like Mandy’s idea of a knitted mobile …), but I’m still happily knitting small things for some other forthcoming tiny people. I’ve already got a little blue jacket on the gift shelf but as insider information suggests that at least one impending arrival is to be a little girl, and I just couldn’t be bothered to think up a pattern to embroider daisies around the hem of the blue jacket, I thought a little pink was in order. 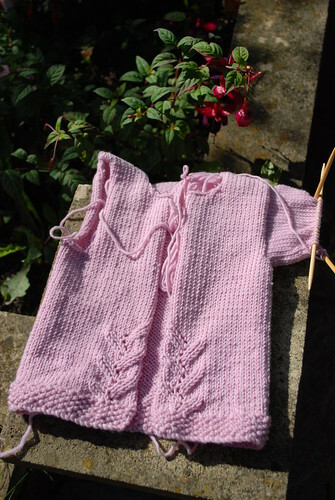 In the form of the Provence Baby Cardigan which I seem to have had favourited on Ravelry for ages and ages – high time I got around to making it. It’s a free Classic Elite pattern which was originally designed to be knit in bits and sewn together but I’ve made a few adjustments to get it as seamless as possible. The first change was to knit the body all in one to the underarms; I simply cast on two fewer stitches than the back called for, and one less for each of the fronts and marked the three sections out with stitch markers. When I got to the underarms I worked across a full row, casting off one fewer stitch than the pattern suggested for each of the four cast off sections (they run into each other so where the pattern says you cast off four stitches at the side of the front and at the side of the back, you end up casting off a total of 6 stitches – one fewer for each side). But before we get to the underarms, I played around with the lace pattern to make the sides symmetrical, simply by starting the lace pattern on the right front at row 1 and the lace on the left front at row 4. The rest of the body was as written, until the shoulders themselves which I joined with a three needle bind off – it’s neater and there’s no shoulder shaping in a baby cardie. For the sleeves, I’ve done some reverse engineering. They are designed to be knit from the cuff up but I picked up 50 stitches from the shoulder, and knit in the round working down for an inch before reversing the shaping from the original cuff with decreases instead of increases. The final change I’ve made is to shorten the sleeves by an inch or so by eliminating the last set of decreases; the sleeves look about the right length to me, and for a 6-9 month size jacket I’d rather have sleeves too short than too long. The picture above is from yesterday afternoon when it wasn’t raining and I’ve since finished the knitting and the little cardie is having a gentle block on the conservatory sofa – all I need now is some buttons. 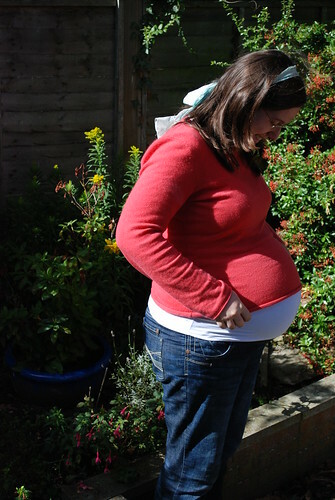 And yes that does explain why I’m wandering around in an old pre-pregnancy jumper with the baby hanging out! 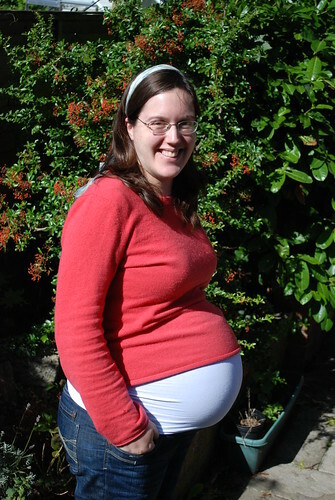 39 weeks down, 1-3 ish weeks to go! I wore socks to bed one night this week and the dog walking jumper has made its reappearance. It’s certainly getting a bit cooler. It’s much nicer being off work once the schools go back, the traffic in the morning is worse but after that there are fewer people everywhere.